This studio portrait captures a slouching dad pulling his daughter on a sled. Dad is wearing a suit, hat, and gloves while the child is bundled up in a winter jacket and warm winter cap. She is holding the sleds steering rope. She won’t go far on the sled considering it is atop straw instead of snow. Dad has assumed a very awkward slouching position for this photograph. Perhaps he is disabled. It is also possible that the photographer did a poor job of posing the father. In fact, the photographer, S. P. Gaugler, shows little skill in his production of this photograph. The subject of this photograph is actually the owner of the Bellevue, Ohio studio that produced this image. 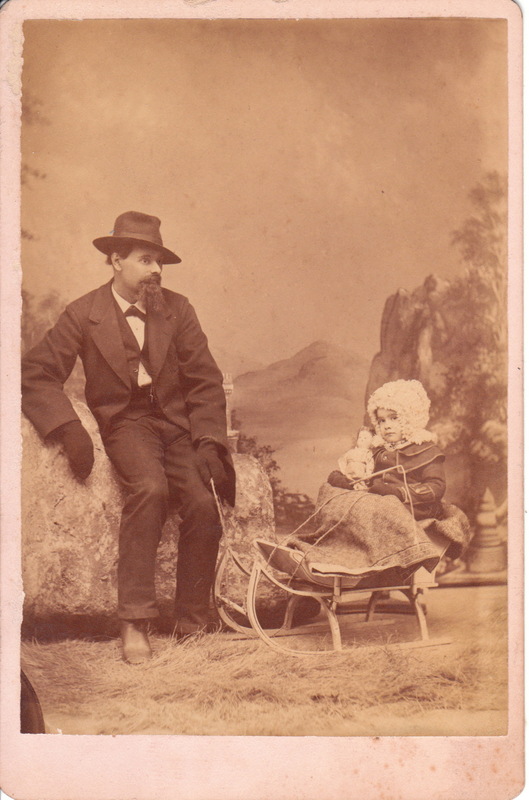 According to the previous owner of this photograph, the album that this cabinet card was taken from indicated that the subject is Simon Peter Gaugler and the little girl is his oldest daughter, Edith. It is surprising that a photographer would do such a poor job of posing for this photograph. The 1880 US census lists Simon Gaugler (1840-1915) as residing in Bellevue, Washington and working as a photographer. He was forty years old and living with his 27 year-old wife Lorinda. The couple had married in 1874 and were raising a four year-old daughter (Edith) with the help of a live-in servant. The 1900 census found the couple still residing in Bellevue and living with their 15 year-old daughter (Ethel). Simon continued to work as a photographer. By the time 1910 arrived, Simon and Lorinda were living in Lyme, Ohio with their daughter Ethel and her husband John. Simon was still operating a photo gallery even though he was seventy years old. In 1914 Lorinda died in Bellevue and a year later, Simon passed away in Atlanta, Georgia. He had moved to Georgia to be with his daughter Edith, the adult version of the little girl pictured above. Edith Gaugler (1876-1960) had become Mrs. Frederick Schanck on 9/10/99. At the time of their marriage, she was a school teacher and her groom was a telegraph operator and clerk. Census data reveals that the couple lived in Lyme, Ohio (1900), and moved to Atlanta, Georgia sometime before 1920. The couple still lived in Atlanta at the time of the 1940 US census. LIMA, Ohio, not LIME….And Bellevue, OHIO, not Washington.